Contrary to popular belief, fatigue is not the same as sleepiness, MayoClinic.com notes. Fatigue is often accompanied by a desire to sleep, as well as a lack of motivation to do anything else. Fatigue can be a symptom of several health conditions including liver disease. Elevated levels of liver enzymes, such as alanine transaminase and aspartate transaminase, can indicate inflammation or damage to your liver cells. Elevated aspartate transaminase levels are also associated with fatigue. You should get regular medical exams to detect potential liver conditions early. Hepatitis, nonalcoholic fatty liver disease, obesity and alcohol abuse typically cause elevated liver enzymes. Liver cancer, cirrhosis and liver scarring also cause an elevation in liver enzymes. Elevated liver enzymes are often noted during a liver function test; consult your doctor for interpretation of your test results and treatment options. A study published in the July 1998 issue of "Pharmacology, Biochemistry and Behavior" indicates that stress and fatigue can cause an increase in the liver enzyme aspartate transaminase. As stress levels increased in the study participants, symptoms of fatigue began to develop. Measurements taken after fatigue developed showed a significant elevation in aspartate transaminase levels, indicating that high aspartate transaminase levels are a sign of fatigue. 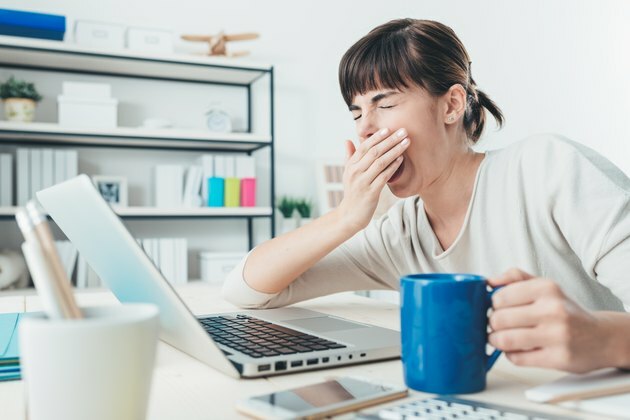 However, more research is needed to determine what other factors affect the way fatigue and liver enzymes interact, as well as their overall implication on liver health. Fatigue is the most common symptom of liver disease, according to a study published in the March 2006 issue of the "Canadian Journal of Gastroenterology." The study pointed out that although there is now a greater understanding of the processes that cause fatigue, but an insufficient understanding of the underlying cause of fatigue associated with liver disease. The results of the study suggest that fatigue very likely occurs because of changes in your brain's neurotransmission. Further research is needed to more fully understand the processes that affect liver disease-associated fatigue, as well as the effects on liver enzyme levels. Lifestyle factors such as alcohol abuse, caffeine consumption, excessive physical activity and sleep deprivation often cause fatigue. Psychological factors like anxiety, depression and grief sometimes induce fatigue. However, fatigue is also caused by medical conditions like acute liver failure, chronic fatigue syndrome and heart disease. As such, making health-conscious lifestyle choices and keeping a positive disposition are possible ways to lower your risk of developing fatigue. This includes eating healthy food, exercising regularly and getting sufficient rest. Consult your doctor before starting an exercise routine or implementing a diet plan to avoid causing potential health problems. What Are Causes of Fatigue During Exercise? Does Being Overweight Make You Tired?